“Linda and I are delighted to bring “The Embodied Life™” teachings to Brighton and are grateful to Mark Walsh for inviting us. After many years of leading both Feldenkrais Professional Training Programs internationally and teaching meditation/ somatic awareness workshops, about twenty years ago, I created The Embodied Life School to integrate these diverse yet unified approaches. In this seminar we will learn simple yet powerful practices for being more fully present in daily life through the profound gift of embodiment. We realize that presence is the key to moving in the direction of true human freedom, where we can make new, life-giving choices. As Moshe Feldenkrais emphasized, unless we are aware we MUST keep repeating the past. Our nervous systems will create the same patterns unless given a new choice. The great discovery, that has guided our path for more than 45 years is that our bodies can be the most reliable and accessible doorway to presence which then leads to awareness and freedom of choice! Ordinary people like all of us can learn, through simple and direct practices to grow this capacity for presence, awareness and ultimately the freedom thus allowing us to bring our gifts into this world. More than simply a path of “self-discovery” these teachings lead into the social realm where we can become grounded, centered citizens standing up for social change. We hope to meet you in June. Visit www.russelldelman.com for many articles and videos. Linda Evans Delman has been an international consultant and educator in the fields of Psychology, Conscious Movement, and Spirituality, an authorized Feldenkrais Trainer for more than thirty years. She trained directly with Dr. Moshe Feldenkrais. She has been deeply influenced by Spacial Dynamics™, Eurythmy, Meditation, Prayer and Mother Nature. She joined the faculty of The Embodied Life School in 2015. 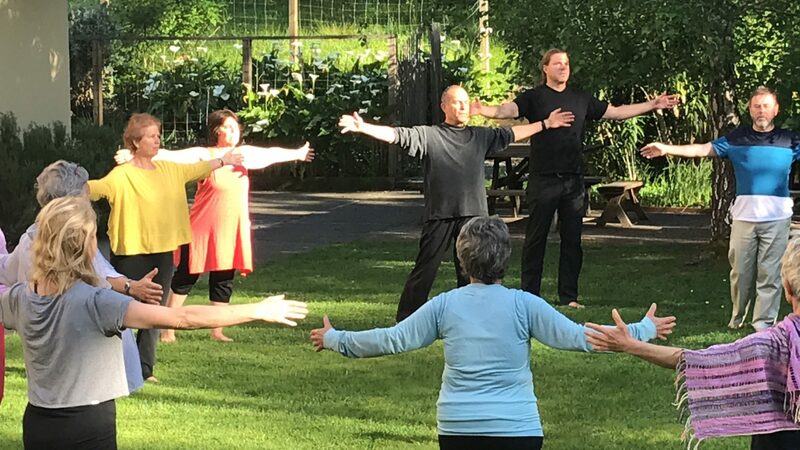 Russell Delman has been teaching Embodied Awareness since 1975 and has been studying in the Zen tradition of Shunryu Suzuki for more than 45 years. He has studied closely with: Dr. Moshe Feldenkrais, Dr. Robert Hall and Dr. Eugene Gendlin. Other powerful influences include Rudolf Steiner, Non-Violent Communication and his work with Mother Teresa in India. Russell has helped educate more than 25oo Feldenkrais practitioners. He founded The Embodied Life School in 1994 which offers mentorships for deep immersion in this path of learning. The Embodied Life School™ is an integrated teaching developed by Russell Delman that is based in the Zen practice of “Just Sitting” (Shikantaza). This work stands on three legs: 1) Embodied Meditation based in Zen 2) Embodied Movement – based in the Feldenkrais Method and 3) Embodied Inquiry which includes various awareness practices based in Focusing, Non-Violent Communication and deep listening. These seminars are experientially based and often provide the ground for transformative life experience. Cost: Early bird rate £400 – by May 20th 2019. Regular rate £600 after May 20. They saw that we MUST repeat the past if we do not grow our capacity for “knowing what we are doing and knowing that we know” which is Feldenkrais’ definition of awareness. To perceive ourselves and the world in new, life-giving ways and to enact new choices, we need powerful practices that can overcome the magnetism of the past.